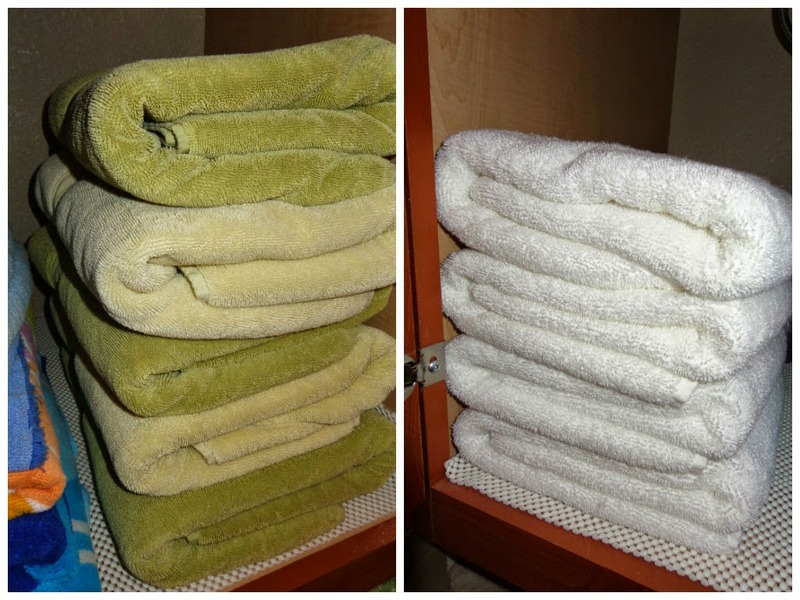 One of my favorite things about staying in hotels is the unlimited supply of clean, precisely folded towels. I’m a towel re-user at home – always was growing up – always will be. I realize that’s not how some roll, but most people I know will re-use a towel a couple of times. I am not on board for their “recycle” campaigns. Every day, I toss all the used ones in the tub and await a new freshly folded stack when I return. This was one of the little luxuries of life on the road when I was traveling for a year. I didn’t have a home, lived out of a suitcase, traveled full time and had constant supply of clean towels in hotels. It’s the little things for me! My Mom stayed home with us when we were kids and she did all the household chores until we were old enough to start taking them on. I still don’t like to dust because that was my chore. But, neither does my Mom, so I think I honestly get that dislike. Ha! Another chore I had was folding clothes. I learned how to and then folded stacks of my Dad’s white undershirts and boxers in precise same-sized stacks and also our towels and wash cloths. All of them folded/faced the same direction. Knowing how to fold white T’s comes in handy because that’s part of my uniform, and I helped a newlywed friend figure out how to fold her husband’s undershirts! I still fold my towels and washcloths like I learned growing up. I realize that this can make some people lose their mind and is completely useless-waste-of-time to others. But, for me, it’s a little bit of order in what could otherwise become another chaotic cabinet. Maybe it’s because that’s how I learned, it takes me no less time to fold like this than it would to fold in all different directions. Lots of homes have “open storage” concepts now and exposed towels folded nicely can be a part of decor in the bath. Even partially folding then rolling them is another option depending on your shevles/display. 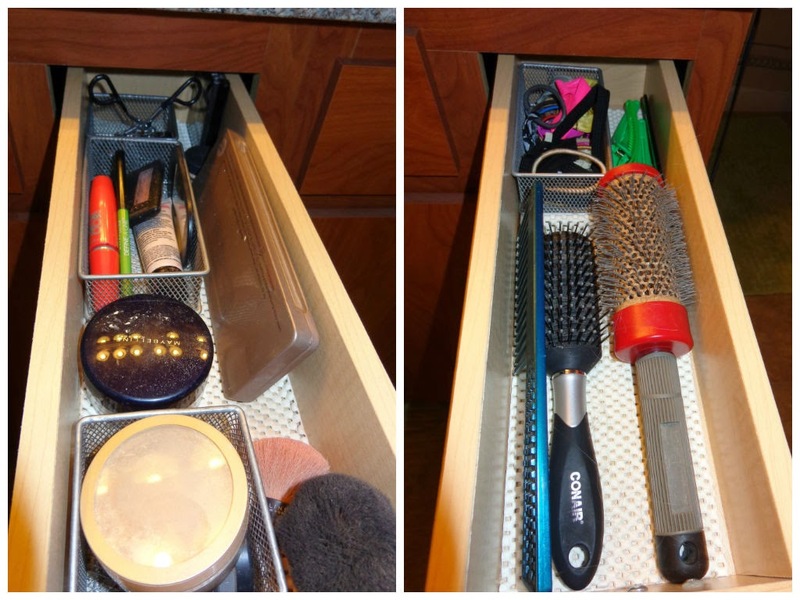 Another part of keeping a bathroom in order are the drawers. Hotels that had bathroom drawers were a little more like home when I was on the road, shoutout to Candlewood Suites! Now, I have the tiniest drawers known to man in my current bathroom, literally less than 5″ wide. They aren’t handy. But, they are what I have. So, my stuff is divided up between them and I use little open weave baskets to help keep some things separate, while not looking like the drawer is full of dividers. Here’s a couple. These organizers can be found in all shapes and sizes to fit any drawers and from Container Store to Marshall’s to Dollar Tree, so get whatever works for you. –Sewing kit, lint roller, shoe shine sponge, etc. –First Aid – bandaids of all sizes, gauze, tape, etc. If you don’t know where to begin with getting a little organized, just start small. Maybe the first step is cleaning out all the old things you don’t use, are out of date or pretty much empty. Then start with what works for you, which cabinets and drawers do you use most often? What products and things do you reach for most often? Make them easy to get to! Have no fear, there’s a few things on top of my counter. 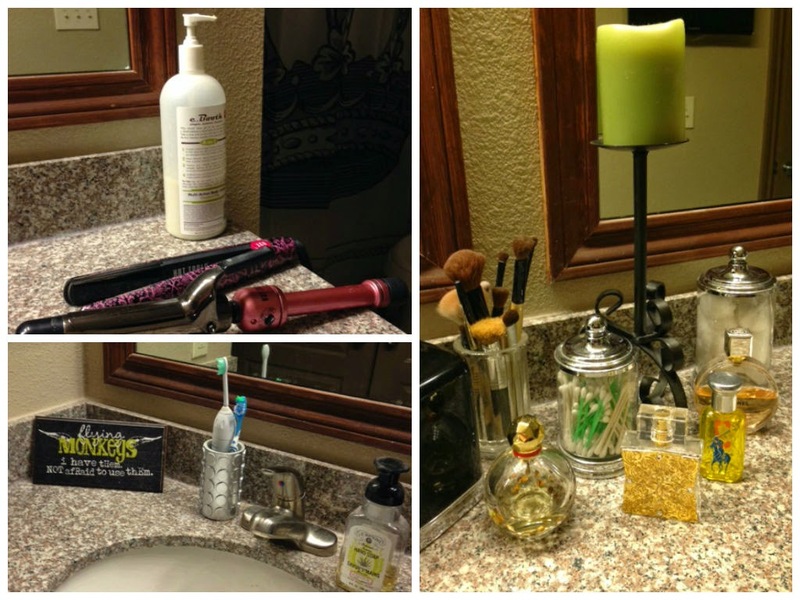 But, it’s not cluttered with all of my products and make-up!